Rusted caps can leak water and rust into the chimney column. A new chase cover and cap on the chimney top solves these problems. 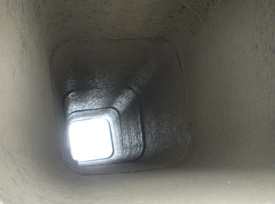 Using various tools of the trade, flues and stovepipes are swept to remove creosote, a build up which is potentially flammable and causes odor. We apply Crown Coats and water repellents to repair cracks on the chimney top and chimney column. This keeps out moisture and prevents damage. New clean out doors keep out critters and improve the look of the home. Other fireplace improvements include tuck point repairs of the firebox, panel replacements and installation of glass fireplace doors.